This analysis is part of the project “Media and History. From cinema to the web. Studying, representing and teaching European history in the digital age”, coordinated by Instituto per la Storia e le Memorie del ‘900 Parri. This analysis has been created by David Groenteman, and edited by Steven Stegers. The analysis gives an impression of how history is represented on television and on the internet in The Netherlands during a regular week. This approach contrast with the research done for the years 2016 and 2017 when the research included an analysis between the history programs and of the posts on social media on National Remembrance Days and Europe Day, and also compared the news broadcasts on these days. For the current research, Inistituto per la Storia e le Memoire del ‘900 Parri asked EUROCLIO and the partners from Hungary, Italy, Poland, Spain and the United Kingdom to research the way history was presented on TV and online during the week of 9-15 April 2018. Matching analysis for Hungary, Italy, Poland, Spain and the United Kingdom are available at http://www.e-story.eu/observatory/. The analysis is made possible with the support of the Erasmus+ program of the European Union. 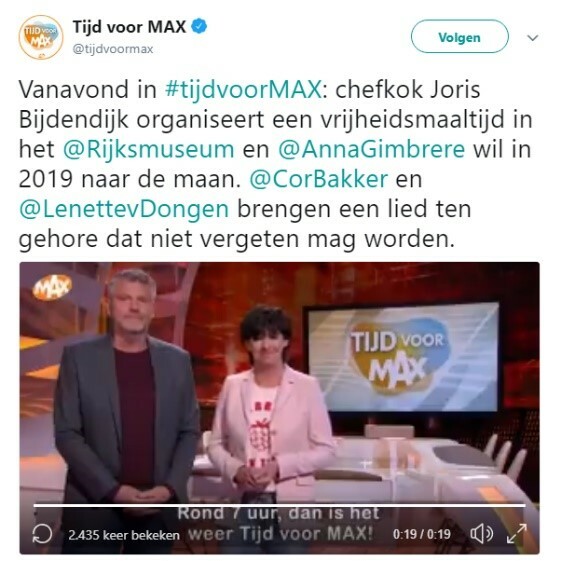 The week from 9 to 15 April was a relatively normal week for history media in the Netherlands, although some noteworthy events did occur. Besides the Tweets and Facebook comments about the Other Times episode, little controversy passed the media in that week. 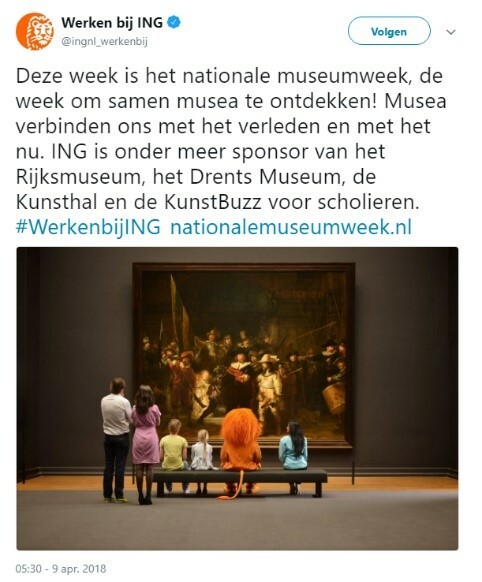 This week was the National Museum Week, in which many Dutch museums are promoted to show people their general importance. Furthermore, 14 April was the Day of The Hague History. During this event, the city organised activities around 40 cultural heritage institutes and organisations to promote the rich history of The Hague. The offer of history related television programs in this ordinary week only consisted of 3 shows. All three did not have a viewership above one million views. Hier Zijn de van Rossems was the best watched programme with almost 800,000 viewers. These numbers are provided by Stichting Kijkonderzoek. The number of programmes is significantly lower compared to the remembrance days. Below you can find a more detailed description of these programmes. All the programmes are broadcasted during prime time. Here are the Van Rossems is a Dutch television show featuring the siblings Maarten, Sis, and Vincent Van Rossem. All being a different types of historian, this programme focusses on the history of different Dutch and European cities with the Van Rossem’s often dry and humorous remarks. The first episode aired in February 2015, and the following description is about the fourth episode of season four that takes place in the city of Amersfoort. This episode was broadcast on 10 April 2018 and had 794,000 viewers, which is average for the show. It is explained that Amersfoort is the cadastral centre of the Netherlands. Sis van Rossem explains that there are in fact 6 different centres in the country, depending on which category you choose. Amersfoort arose from settlements between land and water roads approximately a 1000 years ago. The historical centre of the city has hardly changed during that time. The van Rossum’s discuss which famous people are born in the city: Johan van Oldenbarnevelt (a statesman who supported William the Silent in his revolt against Spain) and Piet Mondriaan (a painter and member of the art movement De Stijl) amongst others. Because of its central position Amersfoort has great military importance for The Netherlands. The many barracks have had a large influence on the city’s development as a whole. The family continues to show different sights, such as the Koppelpoort, the army museum, cavalry museum and the Belgians Memorial (given by Belgium to the Netherlands for their help to Belgian refugees during the First World War). After the monumental side of things, the Van Rossems visit a World War II concentration camp, and Maarten tells the story of Dirk Willem Volmer. Dirk wrote a diary when he was in the camp for two months, and Maarten exclaims how he can’t understand the complete randomness of the torture in the camps. The trio then moved on to talk about various architectural aspects of the city, both historic and contemporary. The show ends at a new neighbourhood that looks like old ruins. This building style was a conscious decision by the architects to contrast the stale style of post-war buildings and houses from the sixties. This television programme does not have a political message, it can be placed under the category ‘edutainment’. The family Van Rossem tells stories and facts about the cities they visit in an entertaining manner. Every now and then Maarten will make remarks or references to contemporary figures or developments revealing his opinion. Different Times is a Dutch television program. 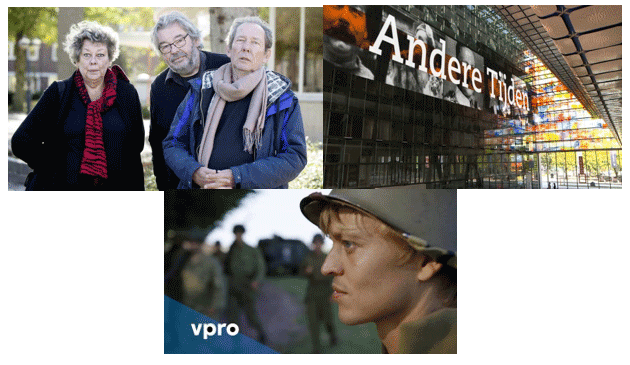 It is made by NTR and the VPRO on NPO 2 and deals with historical topics, often on the basis of current events or a specific date in the broadcast week. Most of the time, the people involved look back on an event of the past that is related to the present. The television program started in 1999. On 14 April 2018, the show talked about the troubles of a new neighbourhood in Amsterdam West. The programme started at 21:00 and drew in 162,000 viewers. Andere Tijden (Different Times) is a weekly history programme about a wide variety of topics. This week they addressed a part of Amsterdam that was finished in 1953. This new neighbourhood in Western Amsterdam was meant to harbour the many new people in the city. The narrator, who is a historian, tells the audience that twenty years ago, the youth would often rebel against the police in the Amsterdam West neighbourhood. Although the housing facilities were very modern at the time, very little had been invested in recreational facilities. The neighbourhood was filled with the children of Moroccan guest workers. Some of the youth who were bored engaging in vandalism and other criminal activities leading to tensions. The show tells the story of this neighbourhood by interviewing people that all have experienced it from a different perspective. Inhabitants, a neighbourhood agent and contemporary local politicians all tell their side of the story. The programme focusses on the Augus Allabe square, which transformed from a modern new neighbourhood to something that could be compared to a ghetto. Some of the young inhabitants stole from local stores. With much boredom and few facilities it was hard to keep order, and there was much disagreement about how to solve these issues. The authorities described it as fighting a losing battle effectively giving up on these young people. The people who were young at the time emphasise that their outcries were not taken seriously by the police and the municipality. The neighbourhood police officer tells the viewer that he frequently had dreams of running into the group of young people who would not let him pass and threatened him. His predecessor was bullied away by the same youth. Eventually a community centre was founded, but by then the neighbourhood already received much negative publicity. The community centre was closed again in 1998 after a big street riot between the police and 150 youngsters. 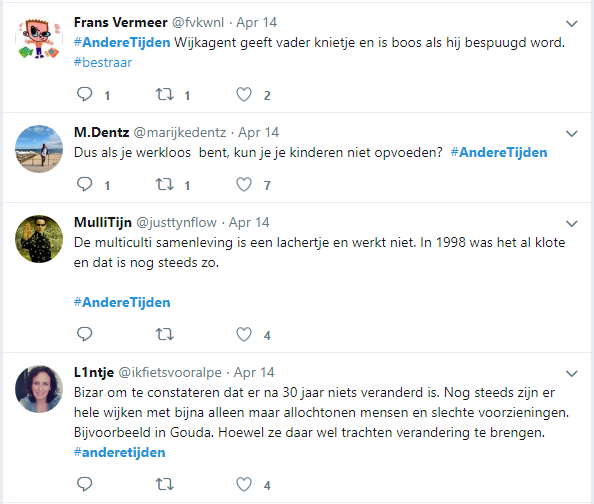 For the episode of Andere Tijden (Different Times) a handful of people commented on the topic of the episode. These were mostly about how nothing has changed since the time of the programme. In others tweets, Moroccans in general are blamed for not taking responsibility for their own mistakes and not raising their children in a proper manner. There was little to no reaction by others to contradict these claims, and neither programme nor the network responded to these tweets. The discussion died out quickly because of this. Nicolaas on the Path to War is a 4 episode series in which Nicolaas Veul tries to find out what place war still has in Dutch society. It was broadcast by VPRO, one of the national broadcasters. This episode was broadcast on April 12 2018 and drew in 131,000 viewers. The 34 year old Nicolaas is searching for the meaning of Second World War in today’s world. He follows and interviews several individuals and groups of people to find out. The programme starts with United Kingdom veteran Sir John Jefferies, who has fought in the war and jumped out of a plane in the battle to save The Netherlands from the German occupiers. The programme starts with him jumping out of another plane to commemorate the occasion. The presenter of the programme jumps with him. Sir Jefferies tells Nicolaas that he was shot in the bottom during his jump in the war. Presenter Nicolaas then follows a re-enactment of the battle of Normandy in July 1944. He plays the role of war reporter and interviews several ‘soldiers’. When asked how the soldiers get into their role, one tells him about the perspective that many of the real soldiers in that time had never left their home village and still had to fight oversees. There is a real emphasis on authenticity in both weapons and events. The programme jumps to the presenter telling a story about first person shooter video games, and asks how they hold up in comparison to reality. He visits and participates in an e-sports tournament of Call of Duty 2. The participants tell the presenter that tactics are key if you want to win a battle. Both in war and in video games. Although realistic weapons and scenarios make the game seem more true to reality, you only get a small sense of what being in battle truly is like. One of the players says that although you never want to be in a real war again, it is still important in the gaming world. There is a real urge to survive in videogames, just like real life, despite the infinite lives in the virtual world. Nicolaas then visits several veterans. The first one is Michael Hurr. He says that if there was no adrenaline in war, nobody would do it. That the war gives you the feeling of rising above yourself. You get the chance to be a hero and truly mean something. He admits that this is a romanticised image of war. The second veteran is Mr. Moerman. He is 101 years old and tells Nicolaas about the Day of Horror, where 98 soldiers found their demise on the airport of Ypenburg. In the end the airport was re-conquered. Mr. Moerman tells that he never had any ambitions for war, and had a more business mind set. However, it was obligatory to go. He describes it as a very traumatic experience. When asked if he considered his fellow soldiers as true friends, Moerman explains that despite the close connection, it is still different from his friends at home because of the forced circumstances. There is little time for in-depth conversations. Moerman considers war to be a curse on the foolishness of the human race and the inability to coexist in peace. The presenter concludes the episode by saying that despite the most realistic efforts to re-enact, you cannot actually reach the true feeling of war without being in one. It is like a horror movie, except It is real. Nicolaas op Oorlogspad gives some impression, but does not provide a deep analysis of what the Second World War means for the world today. he show relies heavily on emotional anecdotes and arguments. It captures the attention of the viewer through some very powerful and emotional moments. In order to find out how history was represented online, we analysed the content that was published on blogs, podcasts, social media, and website related to history in the week of 9 to 15 April 2018. Historiek is a website developed as a civil society initiative, and well known in the community of people interested in or working on history. During the week we focussed on, 24 articles were posted on this website. The articles fall in the following categories: historical storytelling, news about history, analysing historical events or phenomena, connecting past and present, opinion making. The articles are mostly written by the editorial board of Historiek, but some of the specified authors are: Auke Zeldenrust, André Horlings (journalist), Girbe Buist (historian), Enne Knoops (history professor), Pieter de Jonge (political historian), Fons Knockelmans (parliament reporter), Jona Lendering (historian) and the Radboud University. The involvement of the professionals, indicate that the website is a respected medium. IsGeschiedenis (IsHistory) is a website that provides daily historical backgrounds to the news. The website claims to be the biggest history website in the Dutch language and boosts to have circa 300.000 unique visitors per day. The website is run by Virtùmedia B.V., which a commercial publisher targeting people who studied higher education, including Geschiedenis Magazein (History Magazine). In Annex 2, you can find all of titles and links of all 5 articles that were posted in Historiek in the period from 9 to 15 April. The content is very mixed. One articles is about the destruction of cultural heritage, one is about providing historical background to the news of that day (the meeting of leaders of North and South Korea), one is a teaser for a TV programme (Hier zijn de Van Rossems, described above), one is a teaser for a thematic history week (organised by RomeinenNU, RomansNOW, a group aiming to raise awareness about the Roman history of the Netherlands), and one is about the honouring of person for his activities in the Dutch resistance. There was only one podcast published in period from 9 to 15 April. This was the a podcast about political actions of women throughout history, from the podcast ‘Geheugenissen’. For social media we analysed the posts on Twitter and Facebook. Under the hashtag #geschiedenis (history) there only was one tweet by a man who had found an old coin with his metal detector. Most posts related to history on Twitter that we could find were from institutes who are focussed on history in a professional way. The Rijksmuseum in Amsterdam has been active on twitter. On April 13 they celebrated their 5 year anniversary of reopening after renovating. 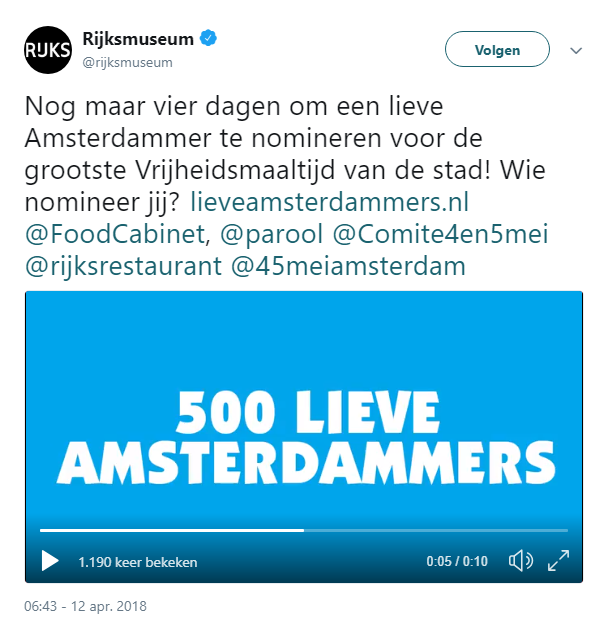 They also tweeted about the birth of Leonardo da Vinci as part of the #onthisday campaign, and reminded people about nominating an Amsterdammer for a ‘freedom meal’ on the 5th of May (liberation day). Futhermore, the Rijksmuseum retweeted several history related tweets to promote different events and television programmes. On the page of the Day of the Hague History there were several post to promote this day. It is not possible to make hard conclusions about the way history is being represented online and on TV on the basis of this analysis. The research does seem to indicate that there is less attention for history during a normal week than a week during which the national remembrance days take place. The research also indicates that there is not much attention for history. There are only 3 history related television programmes with under a million viewers and a handful of websites posting about historical news. This may have to do with the fact that we focused our research to information that was published in Dutch, and Dutch is a relatively small language. The fact that one of the TV programmes focussed on the history of World War 2 supports the conclusion from the previous report that there is a stronger focus on this that on the history of Slavery. Items of online mentions most attention to history goes to the organised historical events such as the National Museum Week and the Day of The Hague History and professional organisations like the Rijksmuseum. The aim of much of the communication is to encourage people to participate in the events. Most efforts to share information about history by history enthusiasts seems to be centred around Historiek. 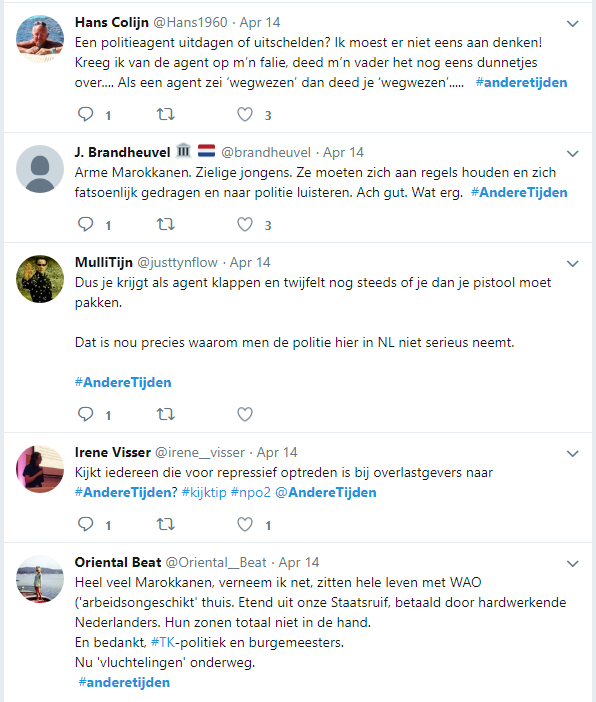 The responses to the Andere Tijden episode reveal the views of some of the active social media users, which indicate that migration and the concept of a multicultural society is still a sensitive topic that many people have a strong opinion on. Since there were no efforts to challenge these strong opinions, it seems that discussions about history on social media during normal days, contribute to deepen societal divisions as people who post are only further confirmed in the beliefs that they already have. For example, in 2016, there were 12 history related programmes on 4 May (which a National Remembrance Day).